The Stock Market – a game that can make you millions of Neopoints with a few simple clicks... oh yes! Now you're probably jumping out of your seat, thinking, "I WANT TO MAKE MILLIONS!" Well, never fear! This article covers the ins and the outs of successful buying and selling! If you follow these tips, you'll be making millions in no time! Unfortunately, there is some risk involved; if a stock declares bankruptcy (selling for 0 NP/share), you will lose your entire investment. I am happy to report that in my two of playing, I have never once seen this happen. *Note – If you already have plenty of NP to spare, then feel free to skip to Section 2. The Stock Market is an investment – not free money. Therefore, I highly recommend earning at least 15k before playing. You can begin with less, but you'll make less profit in the future. Earning 15k is a very easy process that should take no more than 15 minutes. The process is so short and simple, that I recommend playing the games each day to cover that day's stock investment. Below is a list of games, along with the amount of money I earned for playing it three times, and the amount of time I spent playing each game. Wheel of Slime 225 NP (*Spun once) <30 Sec. Wheel of Slime can be spun every 8 hours for free NP. Winnings range from 100 NP to 2000 NP. Fashion Fever 900 NP <30 Sec. A very simple game: simply hit 'Start Game,' then hit 'End Game' and send your score for 300 NP. Repeat three times for a total of 900 NP. AdverVideo 2,800 NP 3 Min. Watch advertisement videos, then spin a wheel for free NP! You can watch up to 5 videos per day. Catch the Petpet 1,467 NP 1 Min. Simply click on the Petpet that it asks you to find. Do it quick enough and you'll earn 700 points for 489 NP. Kass Basher 3,000 NP 2 Min. Note: Before sending scores for this game, I highly recommend unlocking the bat, which will hit at least twice as far as the stick. Once you have the bat unlocked, wait for the wind speed to reach 9 MPH and Bash that Kass! Usually a score around 900 points will net you 1k. Darigan Dodgeball 946 NP 1 Min. Move your Kiko around the screen to avoid the dodge balls. I usually last for about 10 seconds, netting 300 NP. Tunnel Tumble 1,135 NP 1 Min. Smug Bug Smite 1,712 NP 2 Min. Click on the Bug Brother's as quickly as you can. I scored 573, 564, and 576 for 1,712 NP. Wrath of the Snowager 3,000 NP 3 Min. Play on Hard mode and use the arrow keys to control the Snowager and collect the loot. Score 100,000 points and end the game for 1,000 NP. Total 15,185 NP About 14 Min. And congrats! You've earned over 15,000 in less than 15 minutes! Now it's time to start playing The Stock Market! With 15k in hand, you're now ready to invest. On the main page of Neopets, click the link under the banner that says 'Neodaq Index.' This link will take you to the Stock Market's main page. If it's your first time visiting, the scrolling bar, the links, and the loads of information thrown at you might seem a bit overwhelming. But, don't panic! The Stock Market is actually really easy to play. First, I will explain the eight links at the top of the page. Home – Takes you to the Stock Market's Home Page. This page mentions two rules, which I will fully explain in the next section. Find Stocks – Allows you to search for a certain company by typing in the company name or you can click for a full list of all companies available. I highly recommend the latter, as it allows you to easily compare your options. News and Research – Lists the current numbers for the Neodaq Index and the stock of the day. Profile – Allows you to type in a company's ticker symbol (example – The Presidential Palace is TPP) to receive more information about the company and to view its competitors. Message Board – Links to the Stock Market Neoboard. Here you can chat with others players to share buying and selling tips, ask for help, or check prices of stocks from previous times. My Portfolio – Lists all the companies you own stock in. This tells you the quantity of stock you hold in each company and the price you paid for it, the current price of the stock, the market values of each of your shares, and the percent difference between the price you paid and the price it's currently selling for. Buy – This is where you buy stocks. If you know the ticker symbol, you can type it in. Otherwise you can hit 'Click to list' and when you choose a company, it will automatically be inserted into the box for you. Then type the number of shares you wish to purchase, and hit submit. Help – Takes you to the Help Pages. If this guide doesn't answer one of your questions, then checking here would be a good place to start looking for an answer. This is the company 'Super Splime Shakes' as indicated by the ticker symbol 'SSS.' The green color tells me that share value in SSS has increased since the Stock Market opened. The 22 tells me that shares are currently selling for 22 NP a piece, which, as indicated by the +4, is an increase of 4 NP from earlier. Clicking on any of the companies in the scroll bar will take you to its company information page. Now that you know the basics of the stock market, it's time to invest! Section Three: Buy! Buy! BUY! It's time to buy your very first stock! Before beginning, let's go over the two rules mentioned on the Stock Market's main page. 1) You may only purchase stock from companies that are selling shares for 15 NP or more. 2) The daily purchase limit is 1,000 shares. This is the reasoning behind earning 15,000 NP. The goal of the Stock Market is to buy low, then sell high. So we'll want to purchase shares at the lowest amount possible, which is 15 NP per share. We also want to make the max investment per day possible (1,000 shares) to have the biggest payout. So, 1,000 shares at 15 NP per share equals 15,000 NP. Always Remember: There is no way to tell if one company is going to do better than another; the Stock Market is random. Because the Stock Market is random, the best strategy for buying stocks is to invest in as many different companies as possible. That way you'll have the best possible chances of hitting a lucky company. But, this doesn't mean shouldn't make multiple investments in one company, because the more you invest, the higher your payout when that stock does rise. My personal strategy is investing in the companies I already own before purchasing new ones. For example, let's say I have shares in UNIB, which is currently selling for 15 NP a share. I will invest my 1,000 shares in UNIB for the day. If UNIB was selling for 16 NP a share, I would search for other companies that are selling for 15 NP a share and invest my 15k in them. I feel that this allows me to increase my investments and add new ones at a relatively equal rate. Click on 'Buy' in the links at the top, then hit 'Click to List' to see a list of all companies available for purchase. Search for companies with shares selling for 15 NP. Different actions can be taken depending on the number of shares available. No Stocks Available for 15 NP – I recommend waiting until the stock prices change again. They change around :28 and :58. One Stock Available for 15 NP – Great! This makes things simple! Buy 1,000 shares in that company! Two or more Companies Available for 15 NP – You can either choose one stock to invest all 15k or you can spread your 15k evenly among all the available ones. After choosing a company, type the number of shares you wish to purchase and hit 'Buy Shares.' And congrats! You've officially made your very first investment! Make sure to add the Stock Market to your list of dailies and invest your 15k each day! Within a month, you should be well on your way to good profits. I also recommend adding a PIN to the Stock Market at this point to protect your investment. Section Four: Sell! Sell! SELL! This is where the game starts to get exciting and when you start to make profit! Your selling strategy should be exactly as it sounds like: YOUR selling strategy. Unlike buying, selling is not a one-size-fits-all deal. You don't even have to sell all your shares at one time. You should do whatever works best for you. I will suggest popular strategies to get you started, but you may eventually find something totally unique that works for you. The Quick '30' Strategy – Sell when your stock is selling for 30 NP a share. You'll earn a 100% increase (x2) on your investment. This strategy is great for beginners and those who are looking for quick profits, because stocks reach 30 NP/share relatively quickly and often. If you aren't looking forward to some months without profit, then Quick '30' might be your way to go. The Balanced '60' Strategy – From what I've seen, this is the most popular strategy. Sell when your stock is in the range 60 – 70. At 60 NP/share, you'll earn a 300% increase (x4) on your investment. This is a great strategy for people who are looking to grow their investments in the stock market, while still making profits in a timely manner. Compared to the '30' strategy, stocks will hit the 60 mark much less often, but you'll earn twice as much. If you're looking for larger profits and don't mind waiting for decent amounts of times, then '60' should be your choice. The Huge Profit '100+' Strategy – Sell when your stock is selling for 100 NP or more per share. At 100 NP, you'll earn a 566.67% increase (about 7.75x) on your investment. This is a great strategy for those who have loads of money to invest and can afford to wait for large profits. Stocks rarely hit the 100+ range, so you'll be selling a lot less than you would in the '30' or '60' strategies, but you're profits will also be much, much higher. My personal strategy is a variation of the Balanced '60.' When I see a stock reach 60 or higher, I don't immediately sell it; I watch its share value. If the share value decreases at the next change, I immediately sell all shares. But, if it increases, I continue to let it rise, then immediately sell all shares when it decreases once again. The Stock Market is open 24/7 and stocks change around :28 and :58 of each hour. So keep checking back to see share prices! Again, stocks should be sold when YOU'RE happy with your profit (not because some guide NT article told when to sell). When you're happy with your profit, click the arrow next to the stock that you wish to sell. This will pull up a list of group of shares you've bought. Sell as many shares as you'd like. You can sell all the shares or you could sell half, in case the stock grows more. It's up to you! After making your first large profit, make sure to continue to investing, so your profits continue to grow! The Stock Market is a great way to earn millions of Neopoints with only a few clicks each day. Remember the more you invest, the more you'll see your profits grow! The Stock Market is a game, play and have fun! 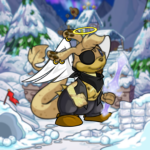 Within my two years of playing, I've been able to make loads of Neopoints. I've had two profits where I've made over 800k and many more in the 300k to 700k range. The Stock Market is definitely a worthwhile investment and I highly recommend you give it a try! Interesting Fact: (From Editorial 349) Long ago, stock prices could be influence by doing things throughout Neopia. This was stopped after guilds began getting together to influence stock prices. Interesting Fact: (From Editorial Once a company declares bankruptcy (stocks selling for 0 NP/share), that company is out of the Stock Market forever. 12 companies have declared bankruptcy, they are: BBBB, BODA, BOOM, HAKA, JCK, KATE, NEGG, NTV, SILL, SSGS, TCAG, and TEFV. I hope this guide has helped you to learn how use the Stock Market to your greatest advantage! If you have further questions or concerns, you may contact me, check Neopets' Help pages, or ask the kind folks on the Stocks Neoboard! I suppose that it all started the day my first owner took me to the pound. Dear Mrs. Rittaninny, I'm sorry this assignment is late. Exactly why it's late is a long story that I'll have to tell you someday.